The Alkapod converts regular water into alkaline, ionized water that you can drink anywhere, anytime. A technological breakthrough in portable water ionizers. 13 minerals transform your source water. Patented stainless steel design certified as safe and free from contamination. Gives you full hydration by reducing molecular cluster size. Did you know that most North Americans are chronically dehydrated, typically by 40%? Avoid the attendant medical problems! Uses natural Far Infrared Ionization to increase antioxidant power. 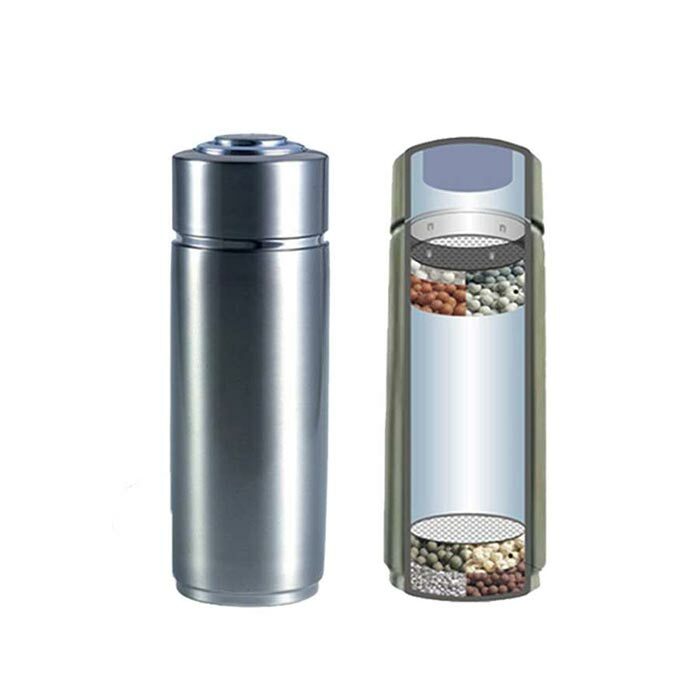 Silver Ceramic and Anti-bacterial granules keep water free of germs and molds. Portability and stylish design makes it unique, convenient, and ideal for driving, travel, office, school, hiking and anywhere you need to be on the go! What are Main Ingredients in the Alkapod? Zeolites are a rare group of minerals with a four-sided honeycomb structure and a natural, negative magnetic charge. Zeolite can absorb and retain heavy metals and toxins. These can then pass safely out of the body without re-absorption. Maifanshi comes from valley streams rich in porphyritic pea gravel. Traditionally, maifanshi has been used as a general health medicine in Asia and also for bathing, due to its ability to absorb toxins and supply many trace minerals. In the AOK, maifanshi helps to clean, remineralize and ionize the water. The Need for an Alkaline Environment – Our bodies function best when they are neither too acid nor too alkaline. Unfortunately, most of us have become overly acidic due to poor diet, popular beverages, lack of healthy exercise, environmental contaminants and stress. Acidity or alkalinity is measured by “pH”, and ranges from 0 (highly acidic) to 14 (highly alkaline) while a pH of 7 is neutral. .Our blood system is always working to keep itself in the narrow range of pH 7.35 to 7.45. Drinking alkaline water helps the body maintain a healthy pH level. An easy way to assist your body in becoming more alkaline is to drink alkaline water. Importance of Water – Water sustains all forms of life. Water is the medium through which every metabolic function occurs in the body. If you are even slightly dehydrated at a cellular level, this will impair your cell’s ability to do its job. Proper hydration is crucial to good health, and not all water hydrates equally. Drinking the right kind of water will help improve wellness and longevity. Water from your Alkapod portable ionizer hydrates you most effectively. By reducing the size of molecular clusters, this allows your body to more readily absorb water. Oxidation – Free radicals are unstable atoms which react with healthy cells causing oxidative damage. It’s the same thing that makes an apple turn brown or iron rust. Researchers believe that free radical damage is a contributing factor in nearly every known disease and aging. Antioxidants stop oxidation. Hydride ions (H-) have an extra electron that neutralize free radicals. Alkaline water is abundant in very small molecules of activated hydrogen which can help to counteract oxidative or free radical damage. It acts as a super-pervasive antioxidant due to its molecular weight of 18 daltons (takes less than 500 daltons to cross the blood-brain barrier). Many authorities such as Dr. Ted Baroody (“Alkalize or Die”) and Sang Whang (“Reverse Aging”) all recommend drinking water with an alkaline pH up to 9.5. Your AOK water ranges from pH 7.5 to 9.5. Increased active hydrogen effectively increases pH and helps alkalize your body. Regular tap or bottled water has oxidizing properties. Your AOK creates negative Oxidation Reduction Potential (-ORP). This means water from your Alkapod helps counteract this type of damage. ORP values typically range from approximately -50mv to -200mv (results varying depending on the type of water treated). The Tourmaline in your Alkapod produces negative ions and also helps reduce the size of the water molecule clusters. Helps to remove bacteria from potable water. “Just a quick update. I’ve not felt this good for 15 years! My _____ has almost completely gone and the itching has all but stopped. I can’t begin to tell you how the quality of my life has improved! At the same time as the Alkapod arrived, I had started a regimen of various vitamin/dietary supplements. I’ve stopped them. Over that period, the only constant was my use of the Alkapod – indeed I’ve found that if I didn’t take the 2 litres/day, I could notice a difference!! I drink nothing but alkalised water; if I have tea (usually green) or coffee (not many) it’s made on alkalised water. We prepare the water by using filtered water (thru a Brita filter) and then into the Alkapod for at least 10 mins – by the microwave timer! My wife nor I can believe the difference there is of being on alkalised water for only 2 months! I’ve diarised a to-do to give you a follow up in a months time Have a great day. Kind regards”Jules B. How is the Alkapod portable ionizer differ from a regular water ionizer, like the Jupiter Melody or Venus?The Alkapod does not use electricity (electrolysis) to produce ionization. Instead, it uses mineral crystals that produce an ionization effect that is less powerful than a regular ionizer. Ionizers such as the Venus and Melody have much more comprehensive filtration and produce higher levels of pH (alkalinity) and antioxidant power (-ORP). The Alkapod’s value lies in being very portable: for work, travel and as a complement to your home ionizer. Of what kind of metal is the Alkapod made?# 304 Stainless Steel. What is your return policy?You can return an unused Alkapod within 30 days for a full refund of product price. Energized, healthy water you can enjoy anywhere!